Some great feedback from our satisfied clients in Connah's Quay and accross the country. 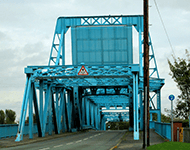 Providing a full range of building surveying services to owners and occupiers of residential, commercial and industrial premises in and around Connah's Quay, the Right Surveyors fundamentally understand that each client has different budgetary and unique property requirements. Our team provides a wide range of professional services including Property and Building Surveys, Project management, Contract administration and formal party-wall. Give us a call on 01352 330 123 or Freephone on 0800 880 6024.